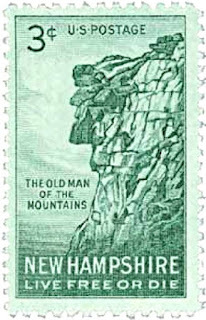 If you haven't already seen the Old Man of the Mountain on a the cliffs of Cannon Mountain in the White Mountains of New Hampshire, then you are too late. For, in 2003 he lost his face. 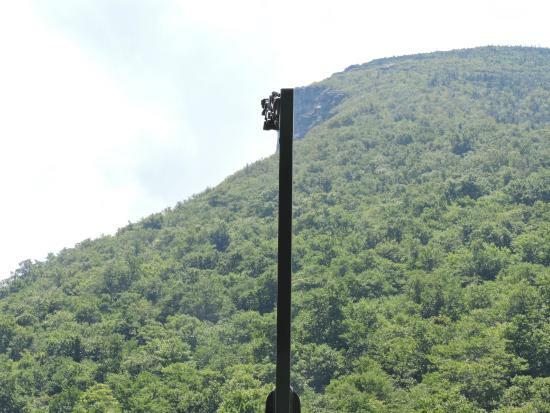 His profile was first recorded in 1805 by a team of surveyors who were working in the Franconia Notch, though it is supposed that it was formed about 2,000 to 10,000 years ago after the last glacial period. 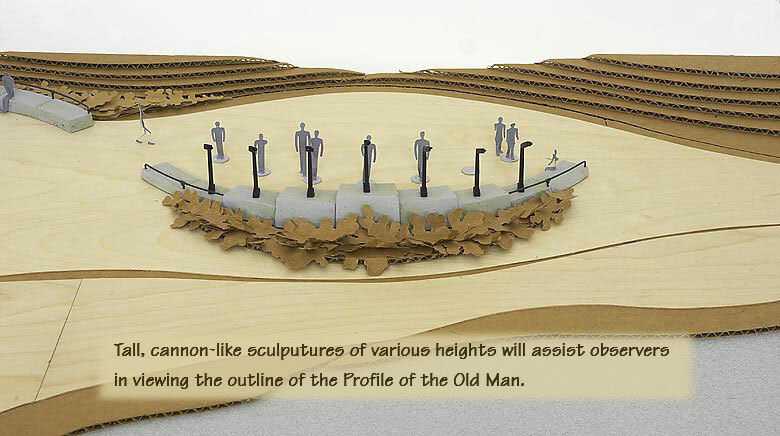 The formation was a series of red granite ledges carved by glaciers that when viewed from a specific spot had a distinct image of a stern old man with an easterly gaze. One ledge formed the chin, another his upper lip and a third his nose, with two further layers forming his forehead. When viewed from other locations in Franconia Notch, the same ledges had a rough and ragged look, but nothing that would make you think of 'the profile'. Throughout the 1900's efforts were made to keep the Old Man intact and in 1958 it underwent major repair work for improved weatherproofing. After the collapse, the cables, spikes and epoxy cement used in the repairs and attempts to keep erosion at bay were visible like a skeleton. None of the fallen rock was distinguishable from the other boulders where it fell. Now, if you go, there is a Profile Plaza with a memorial (all paid for by private donations). There are seven profilers - described as being like upside down hockey sticks with bumpy bits - that when lined up with the cliff will give you an outline of the face as it would have been on the remaining mountain. Not quite the same, but many felt something had to be done for this state icon, to remember what once was. This 3¢ stamp from 1955 commemorates the 150th anniversary of the Old Man's discovery. For some unknown reason it uses the rarer plural term 'mountains'. 125,944,400 were printed. Such a pity that the old man lost his face. The stamp still is beautiful! Sad that it is gone, however I love the way it had been memorialized. 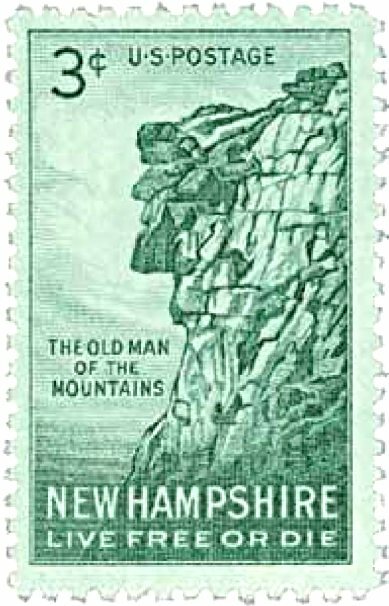 Pleased to see the Old Man of the Mountain here as well. Guess gravity took its toll, shame. Nice to have the stamp as a reminder. I remember seeing him before he started falling apart.